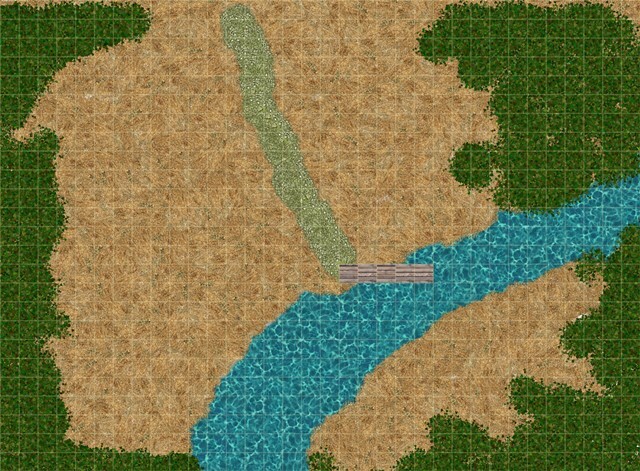 The long pursuit along rivers and through jungle led the adventurers to this small beach and stream where the Emerald Claw had set up a small camp. The map as used in the session had extra tents and barrels placed on it, but this basic map makes a good setting for all sorts of encounters, so I thought I’d add it in anyway. The adventurers started at the bottom right of the map in thick jungle, and the Emerald Claw troops were largely placed in the open sandy terrain. A small flying skiff was moored above the river as an elevated lookout point, but with two druids in the adventuring party, they soon found that being surrounded by jungle made for a short defence against motivated attackers.